I used to love going to baby showers. It’s true. I was that weird girl who didn’t have kids yet and got absolutely thrilled about showers. I knit. 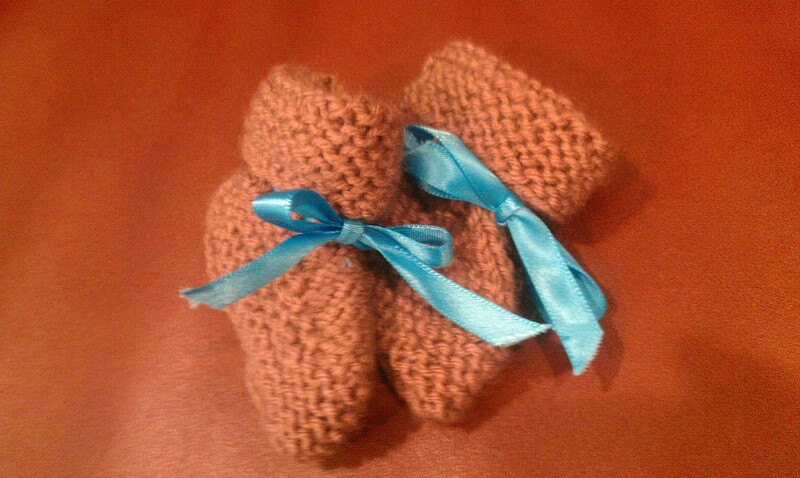 I knit baby booties from memory for people I know who are expecting. For some of my dearest friends, I’ve knitted stuffed animals. I knitted an elephant for one of my favorite babies, a teddy bear for a wonderful friend’s new arrival, a panda bear with a tennis ball in the body for a good friend’s 1-year-old, a tennis-ball stuffed frog for another. For my husband’s cousin, who had her first last August, I knitted booties, a little stuffed bird, an egg the bird fits inside, a sweater, and a hat. And I’ve loved making these things for those little ones and for their parents to have. Yesterday I got invited to the first baby shower since we got our diagnosis. I knew it was coming. It’s for my husband’s best friend. I’m excited they’re expecting. I am looking forward to meeting their little boy when he arrives in January. But I’m not looking forward to the shower. I’m not looking forward to it at all. I don’t think it’s just because the whole afternoon will center on babies and all the cute things they come with. Though that’s a contributor. It’s not even because I am sure the shower will present plenty of opportunities for the mom-to-be and her family and friends to ask the dreaded, “When are you going to have kids?” Though I’m not looking forward to that either. It’s the gift. I used to find it relaxing to knit a pair of booties. It’s an easy pattern and I could almost do it in my sleep at this point. But despite its simplicity, it’s still going to take me several hours. That’s several hours watching as little booties grow from a ball of yarn and wondering if I’ll ever get to make a pair for my own child. It seems masochistic. Of course, the alternative is to step foot inside a Babies’R’Us. Guess I should get out those knitting needles. Categories: And Insensitivity, Infertility | Tags: baby booties, baby shower, infertility, knitting | Permalink.